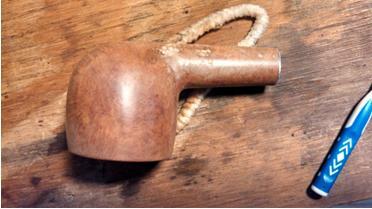 Josiah and I have been emailing back and forth on this old Kaywoodie for quite a while now. 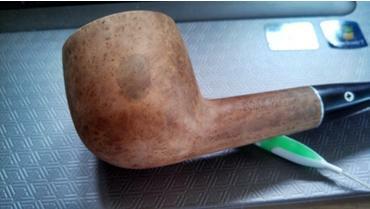 I asked him to do a write up for the blog on it as he tried some different ways of minimizing stains to the briar. Each method he used has its own application and effect. Josiah did a great job writing this up and demonstrating the way the method worked and the results of the application. Thanks Josiah for the great work. I look forward to reading more about your refurbishing in the days ahead. 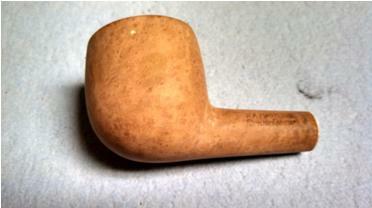 This last August, I acquired a Lot of estate Kaywoodies. All were in fair condition. Some looked like old, loved friends and a couple hardly smoked at all. 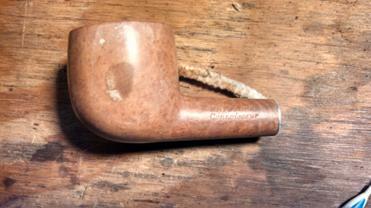 One was unsmoked with the price sticker still on the stem. I’m guessing that all came from the same estate judging from the burn pattern on the rims. The main issues to be dealt with were the moderate burns on the rim and some spots from sitting in something wet. These spots proved to be the more serious problem, as you may gather from the title. Among them was this Connoisseur #69 pot. 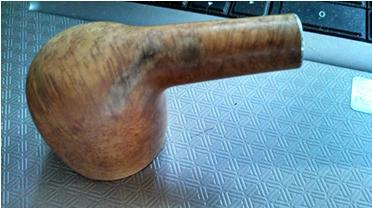 As you can see, there was quite a lot of grime and a large dark spot on the left side of the bowl. 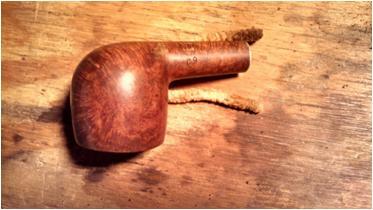 Another, less severe spot was on the bottom of the shank. However, it appeared to be in good condition overall with nice thick walls and no deep dents or scratches. The bowl had some very nice birdseye on both sides. Visions of a nice blond or honey colored stain immediately jumped into my head. Time to restore! 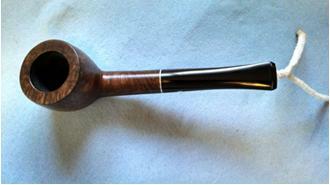 My first steps were to ream the bowl and put it in an alcohol bath and soak the stem in an Oxyclean solution. 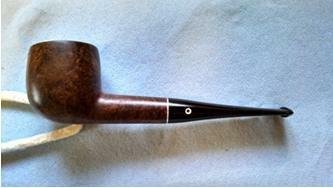 The stem came clean and polished up nicely without much trouble. I heated up the stinger and screwed it in to the mortise while still warm to correct the alignment. The grime on the rim came off quickly, but there were a couple pretty deep scorch marks. I started off topping the bowl with 220 grit sandpaper, but it quickly became apparent that it was going to take forever with that fine a grit. 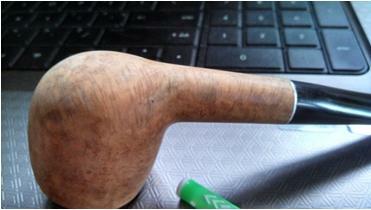 So I started over with 80 grit until most of the burn was removed and worked my way up through 600 until it was gone. Then I put a slight bevel on the outer and inner rim. Now for the real problem. The water marks (I kinda think old motor oil) hadn’t come out in the alcohol bath as I had hoped it would. 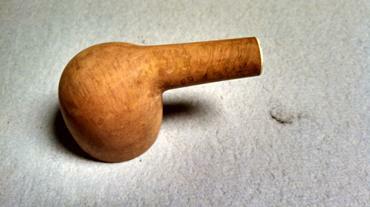 Having never dealt with removing such marks from wood, I decided I needed to consult someone with more experience. I sent an email off to Steve here at the blog for advice. In response he suggested a few options: lemon juice, bleach, oxalic acid and as a last resort sand paper. First, I tried lemon juice.That worked to a degree, but the stains were still clearly visible. Here are the marks after the lemon juice. I figured anything I could see would be more visible after applying stain, but I decided to give it a try anyway. I sanded the entire surface from 220 up to about 6000 grit. I applied stain and flamed it to set the stain. Below is the first attempt…not so successful. So I sanded off the stain again and went for bleach. I almost ruined the whole project here by leaving the bowl in the bleach too long. It raised the grain quite a bit and penetrated further than I expected. 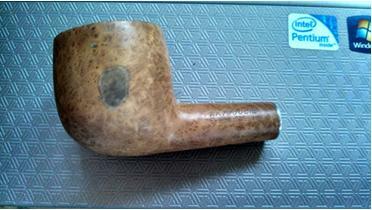 After sanding, I managed to get most of the white patched off and the surface smooth again. Better results, but the stains were still clearly visible. I moved on to oxalic acid crystals. I mixed a paste of crystals and water, applied it, let it dry and sanded the dried mixture off. 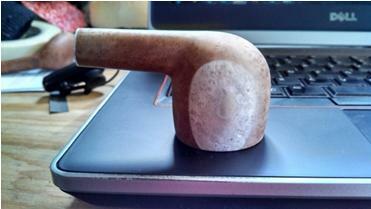 Use a particle mask when sanding this stuff. It’s not something you want to inhale. I tried once more with stain and the results were similar to the second attempt. I seem to have lost the pictures for this, but by this time, you get the idea. This last unsuccessful attempt made it clear to me that I must admit defeat and give up my dreams for a shapely blond and give a brunette a try. 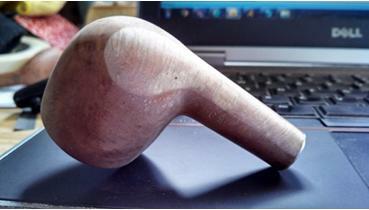 The repeated sanding, staining and sanding again had taken its toll on the nomenclature and the side profile was starting to flatten out. In order to save the now faint stampings, I chose a nice deep espresso color and success! The pesky spots are now hiding well in the rich stain. I think that only a very well trained eye, or one that knew the stains were there in the first place, would be able to spot them. 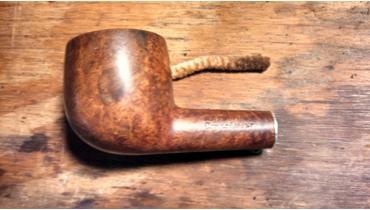 So after a lot of work, I have myself a beautiful Kaywoodie pot. 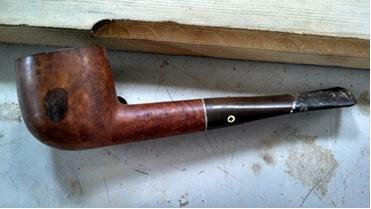 Disaster almost struck in its inaugural smoke, however, when the Kaywoodie club fell out of the stem, the original glue having lost its glue-iness after the soak in the Oxyclean. I managed to find it where I had been sitting and it’s safely superglued back in place. Many thanks to Steve for his suggestions. Even if it didn’t turn out the way I planned originally, I now have options for tackling similar problems in the future and about a pound of oxalic acid to try to remove the stains my 13 year old has left on her bedroom window sill. 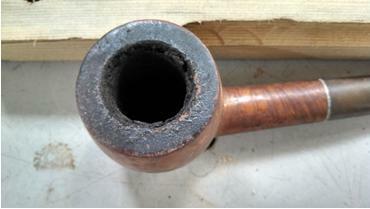 This entry was posted in Pipe Refurbishing Essays and tagged articles by Josiah Ruotsinoja, Bowl - finishing, Bowl - refinishing, Bowls - refinishing, finishing, Josiah Ruotsinoja, Kaywoodie Connoisseur #69, lemon juice for removing dark stains, oxalic acid for removing dark stains, Oxidation, pipe refurbishing, refinishing, refurbishing, Removing water or oil stains in briar, restaining, restaining a bowl and rim, stem work on February 23, 2014 by rebornpipes.